Hi and a ‘Happy Christmas’ to all my readers! At this time of year one really wants something to celebrate and I can think of nothing better than what Sharenergy is achieving. Sharenergy is a tiny and rather wonderful organisation based in Shrewsbury. They organise the setting up and operation of community renewable energy cooperatives. I’m a member of three of them: Leominster Community Solar, Neen Sollars Community Hydro and Woolhope Dome Community Woodfuel. It feels good to be part of really democratic organisations that are producing low carbon electricity, and in the Woodfuel project case, heat. These organisations really do bring ‘power to the people’. The last few months have been very busy for Sharenergy, with lots of new projects at various stages of development. Three of them have just completed successful share offers: Wedmore Community Solar, Dingwall Wind and Llangattock Green Valleys Hydro. Each of these three share offers was oversubscribed, mainly from the local communities. There is an interesting increase in scale and ambition as success builds on success. So for example Leominster Community Solar was a 49KW rooftop system costing £150,725 which completed its share offer in December 2011, whereas Wedmore is a 1MW field scale ground mounted system costing £1.1 million and it completed its share offer in November 2013. Dingwall Wind also completed its share offer in November 2013, raising just under one million pounds needed to install a 250KW wind-turbine. Llangattock Green Valleys has just completed its first share offer, raising £270,000, and are now planning a second hydro-turbine with this share offer due to commence in March 2014. Congratulations are due to all the local communities involved for getting themselves organised and getting on with these excellent projects, and of course congratulations are also due to the team at Sharenergy for making it all possible. They continually have exciting new projects on the go, so do check-out their website from time to time. One wonders what they’ll be doing in a few years time if the number, scale and range of different technologies continue to grow. Wouldn’t it be great if larger, technically cutting-edge projects, perhaps like the 240MW, £650 million Swansea Bay Tidal Lagoon that I blogged about back in August, were either wholly or partly in community ownership! Do explore the Sharenergy website http://www.sharenergy.coop/ There are links to all six of the Sharenergy coops I’ve mentioned in this blog, plus others, and especially to new ones seeking funds to go ahead. This entry was posted in Business Investment, Energy, Environmental, Local on 20 December 2013 by Richard. Hurricane force winds batter much of UK and Northern Europe and a storm surge is flooding countless properties, blowing trees over and disrupting communications. The death toll continues to mount. BBC weather presenter Matt Taylor attributes the devastation to three factors: low pressure creating a bulge in the sea surface, strong northerly winds driving this up against the coasts of eastern England and much of the coast of Northern Europe, and all this coinciding with seasonal high tides. Owen Paterson, the climate change denying Environment Secretary and Conservative MP for North Shropshire said “Conditions like this only occur … every 500 years”. Matt Taylor left out a fourth factor. 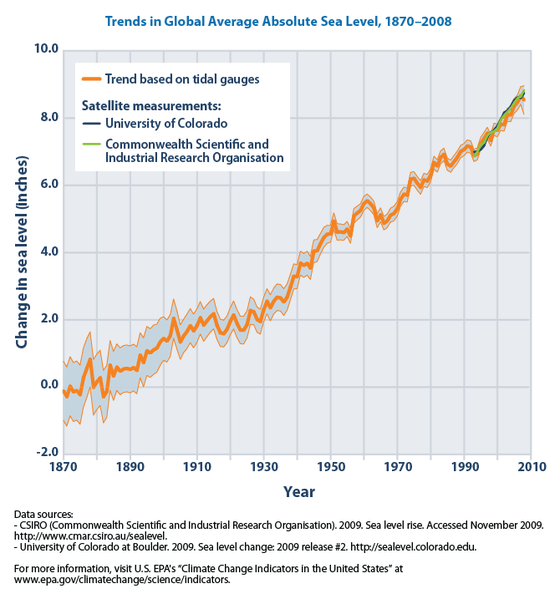 Rising sea levels caused by climate change. The graph above shows that the average rise in sea levels over the last 140 years has been about 9 inches (227mm). These so called once in every 500 year events are getting ever more frequent and rising sea levels are a major factor: so too the increasing ferocity of the weather as a direct result of climate change. Professor David MacKay, who is scientific advisor to the government, has offered to give Owen Paterson a briefing on the science of climate change. Not surprisingly Paterson has declined. Having a scientifically illiterate Environment Secretary is not helpful when it comes to preventing more and greater future extreme weather events. The need for governments to take climate change seriously could not be greater. We also need governments who can see the opportunities for multiple benefits by moving into a post fossil fuel era. We could massively reduce the emissions causing climate change by investing in energy efficiency and a smart mix of renewable energy. Simultaneously we could drastically reduce pollution of all kinds, enhance biodiversity, eliminate fuel poverty and create jobs and even economic growth. Let me here and now challenge Owen Paterson to a public debate on the subject. I don’t suppose there’s much chance of him agreeing, but I’d relish the opportunity. This entry was posted in Climate Change, Politics on 8 December 2013 by Richard. Last week I was bemoaning the lack of political leadership in terms of climate change and the need to cut carbon emissions. Technologically a lot is happening that is to be celebrated. I have frequently written about the potential of concentrating solar power (CSP), praised Spanish technological leadership during the first decade of the current century and lamented the Rajoy governments abandoning of support, and in February posed the question Where Next for CSP. In March I wrote about CSP in Chile. There are lots of interesting global developments that I want to write about as and when they come into operation. Abengoa is one of the main Spanish companies that pioneered the technology over the last decade and a half. As the Spanish market collapsed they have concentrated more of their work elsewhere. In October they completed the 280 MW Solana power plant at Gila Bend, near Phoenix, Arizona. Like most CSP plants it utilizes parabolic trough reflectors to capture the sun’s heat and generate steam and so via a turbine, electricity. Molten salt is used to provide 6 hours of heat storage, meaning that electricity can be generated in hours of darkness or in cloudy weather. 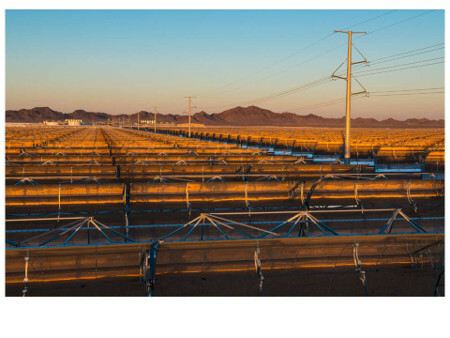 This project is large enough to supply 70,000 Arizona households with reliable renewable low carbon electricity. The $2 billion investment was facilitated by the Obama government’s loan guarantee scheme. Now it is up and running banks and venture capitalists can see it works and have the confidence to invest, as evidenced by Liberty Interactive Corporation investment of $300 million in Solana this October. This project has created thousands of jobs in a supply chain across much of the USA as well as in the massive construction site. Water is a critical issue in this semi-desert area, and interestingly the plant will use less water than was used by the previous agricultural land use. This seems like another project worth celebrating! This entry was posted in Business Investment, Energy, Environmental, Global on 6 December 2013 by Richard.